Easter Seals Central Texas provides exceptional services so people with disabilities and their families can fully participate in their communities. Creating opportunities that advance the independence of individuals with disabilities and other special needs. Easter Seals East Texas Inc.’s mission is to provide exceptional services to ensure that all people with disabilities, special needs or functional limitations have equal opportunities to live, learn, work and play in their communities. Educate, inform and support families who have loved ones with Down syndrome. Provide support and encouragement to new parents of babies with Down syndrome. Organize educational and social opportunities for individuals with Down syndrome and their families that help encourage social and physical development. Give important, current information and support to our families through our quarterly newsletter, website, and e-mail updates. Promote literacy and lifelong learning opportunities for individuals with Down syndrome of all ages. The mission of Down by the Border is to enhance the quality of life and provide support to persons with Down syndrome and their families through promotion of public awareness, advocacy and information sharing with a distinct goal in mind to help individuals with Down syndrome fulfull their dreams and life aspirations. Mission is to provide education, support, and resources to individuals with Down syndrome, their families and professionals and the community while building public awareness and acceptance of the abilities of individuals with Down Syndrome. 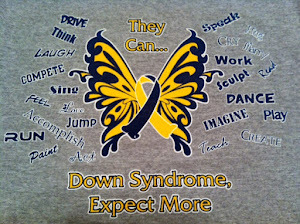 The Down Syndrome Association of El Paso was established in 2007. The primary purpose of our organization is to provide support and education to families who have children with Down Syndrome. Down Syndrome is a chromosomal abnormality which affects people of all ages, races and economic levels. The Down Syndrome Association of Houston (DSAH) has been an important part of the Greater Houston community for almost 40 years. What started out as a small group that met in the basement of Texas Children’s Hospital has grown into a thriving, multi-faceted program with our office located at 7015 W. Tidwell, Bldg. G, Suite 108, in Houston and more than 1,500 members from all over the Houston area. DSAH has branched out into community groups in Baytown, Katy, North Side, Pearland, Spring, and The Woodlands, and others are forming. Down Syndrome Association of San Antonio's mission is to provide services and support for children and adults with Down syndrome and their families in San Antonio and the surrounding areas. Through partnerships with other agencies, medical professionals, educators, and parents, the DSASTX gathers and shares resources and information for those with Down syndrome and their families. The DSASTX provides opportunities for families to foster friendships and offer mutual support through Parent Support Group meetings, community-based social activities, special events, and educational programs. What is the Mission of the Down Syndrome Guild (DSG)? To provide accurate and current information, resources and support for people with Down syndrome, their families and the community. The Down Syndrome Partnership of Tarrant County benefits the lives of people with Down syndrome and their families by providing information, social and educational activities and support designed to help achieve the universally desired goals of self-fulfillment, pride in one’s achievements and acceptance and inclusion in the community. The East Texas Down Syndrome Group provides information, education, and moral support to families in East Texas. Our biggest activity of the year is a “Buddy Walk” affiliated with the National Down Syndrome Society. This is a fundraiser for our group. The purpose of the walk is to get our families and the community involved to promote acceptance and inclusion of people with Down syndrome. There are many activities throughout the year that allow our families to get together and share our experiences with each other and build friendships. There are bi-monthly meetings to discuss ideas for fellowship, education opportunities for our members, guest speakers or training opportunities, a Spring Fling Family Picnic, a New Member Coffee, and play-dates for toddlers, youth and teen outings, & special gatherings for our adults. The mission of GCLFEDS is to provide support and resources to individuals with Down syndrome and their families and to promote awareness, understanding and inclusion in their communities. Heart of Texas Down syndrome Network is a nonprofit organization committed to supporting the community and help them better understand individuals that are diagnosed as having Down syndrome in Central Texas. The group first started in late 2010. It is the vision of the parents of a son born with Down syndrome that wanted to share their experiences with other families of special needs children. INTERNATIONAL MOSIAC DOWN SYNDRIOME ASSC. "IMDSA is designed to support any family or individual whose life has been affected by Mosaic Down syndrome by continuously pursuing research opportunities and increasing awareness in the medical, educational and public communities throughout the world." The Panhandle Down syndrome Guild was founded in 2002 to promote a greater understanding of the medical and developmental aspects of Down syndrome. Along with the National Down syndrome Society (NDSS), which is the largest non-governmental supporter of research and advocacy, and the National Down syndrome Congress, PDSG strives to improve the lives of those persons in the Panhandle whose lives are affected by Down Syndrome. The Panhandle Down syndrome Guild increases public awareness about Down syndrome, to assist families in addressing the needs of children born with this genetic condition, and to sponsor community events. They work with the NDSS to dispel the myths associated with Down syndrome, while helping people with Down syndrome achieve their full potential in community life. PDSG develops and disseminated current information materials, as well as, plans activities to increase an acceptance of people with Down syndrome. The mission of the Red River Valley Down Syndrome Society is to improve the lives of individuals with Down syndrome and other disabilities through support, education, awareness and advocacy. RGV Discover Life Inc. is created to inform and educate new and expecting parents about Down syndrome. We are a new organization in the Rio Grande Valley determined to help and inform parents and families about the special needs and potentials of babies with Down Syndrome. The program provides early identification and developmental services for families of infants and toddlers, ages birth to three. A full assessment of a child's current health and development status. Service coordination among providers, programs and agencies. Strategies to build on family concerns, priorities, & resources (CPR). Developmental services: occupational therapy, physical therapy, speech language therapy, etc. These services are provided through the coordinated effort of parents, community agencies, and a variety of professionals. Places where services are provided include Baby Watch centers, home, and community settings such as child care. United Angels Foundation is a non-profit, parent-to-parent support group that focuses on helping parents and families adjust to the birth of a child with special needs or disabilities. As our name indicates, we view these children as Angels; and, as we support the parents and families of all children that have special needs or disabilities, we are the United Angels Foundation. A non-profit organization established in 1977, the UTAH DOWN SYNDROME FOUNDATION provides outreach, training, support, education, information, and activities for individuals with Down syndrome, their parents and families, and the community. With chapters throughout the state, this volunteer organization has grown to become Utah’s largest support provider for the Down syndrome community. The UDSF strives to bring families together to share experiences, challenges, goals, and dreams and to educate parents and society in understanding and appreciating the needs of individuals with Down syndrome. As parents gain knowledge, they are empowered to become better advocates for their children, thus providing them with increased opportunities to reach their highest potential. The EIEP at the Behavioral Health Division - DD Programs provides assistance and oversight to the regional child development centers that serve young children, from birth through 5 years of age, with disabilities and their families across Wyoming. The Wyoming Down Syndrome Association was established by Ark Regional Services in Laramie, Wyoming to address a void that existed in adequate support available for families of individuals with Down syndrome in Wyoming. Using the resources provided by the annual Wyoming Buddy Walk® and other grants and donations, WyDSA provides education, information, networking opportunities, and support for individuals with Down syndrome and their families. "The Arc of Livingston-Wyoming empowers people of all ages to experience the joys and challenges of life with a growing sense of personal dignity and independence." The Arc of Livingston-Wyoming offers children and adults with disabilities a wide range of services to meet their day-to-day needs with an emphasis on helping them reach their maximum potential. The first three years are the most important building blocks of your child’s future. The Birth to 3 Program is a federally-mandated program (Part C of the Individuals with Disabilities Education Act—IDEA) to support families of children with delays or disabilities under the age of three. The vision of the Down Syndrome Association of Wisconsin (DSAW) is that we all understand the value of those with Down syndrome in our lives and our communities. We continually strive toward full acceptance, full access, full life and full potential. Our mission is to provide support to families and individuals with Down syndrome while advancing awareness, respect and opportunity.